I was intending to sit down today and write about the snowy garden. 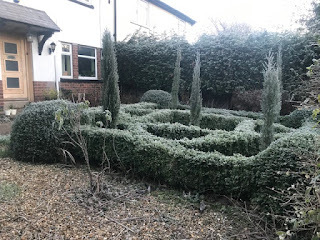 There has been quite a bit of snow in parts of the UK over the past few days and if you have a snowy garden and write a blog then you are obligated by the laws of blogging to write about it. Whilst I look at the photographs of gardening chums around the country and see their snow covered worlds, here in the mild middle we are frozen, but not snowy. I have seen the odd flurry but not one flake has settled so far. Now you could be starting to think that this is a lament over the lack of snow. I also feel in some ways that it should be as I do find looking at snowy gardens and landscapes extremely beautiful. This is not a lament for I am a snow-wimp; I hate driving in it and get very nervous when there are journeys I have to undertake on snowy roads. This week there have been a couple of very difficult to cancel journeys and so not struggling through snow has been a massive relief. 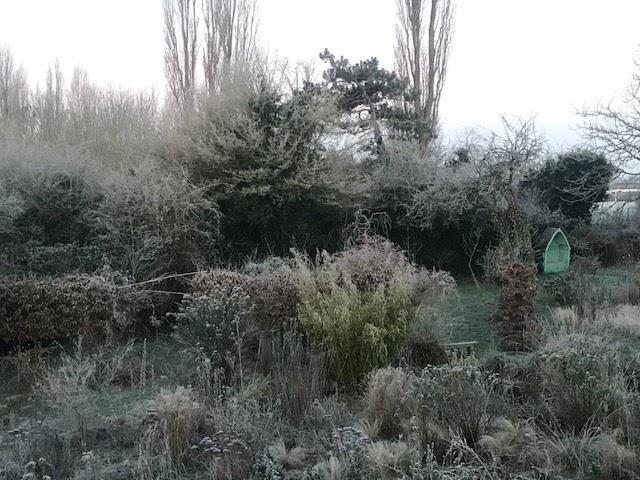 There is something very beautiful about the frost covered garden. So far we have had temperatures overnight of minus 7, which I know is nothing compared to other places but it for here in the mild middle, decidedly chilly. I like how the weather tries to turn the garden monochrome but so far it is resisting....... just. The Knot Garden looks good in the frost. The removal of the lavender edging is still pleasing me and I have no plans currently to replace it. There is now a feeling of openness and space that I enjoy. Having a wider path to walk along on these frosty icy days also seems better. 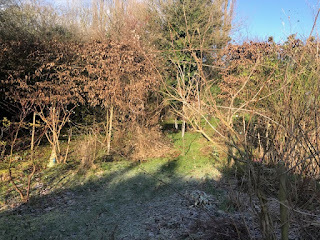 In the back garden itself the frost lingers where the sun takes its time to venture into every corner. This was not going to be a gardening day as the ground is solid. 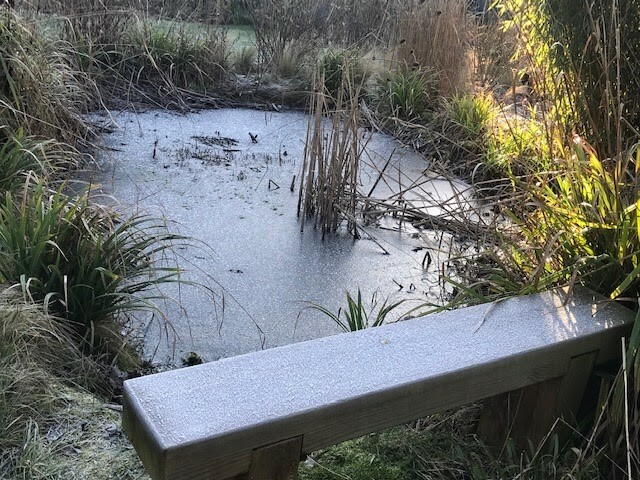 The pond has about 1 cm of ice nearly covering it completely. I have to check this as I have had frogs suffocate in the pond in the past if it has completely frozen over. The edges were still not quite covered but I carefully placed my foot onto the ice and cracked it a little more. Believe me, inflated frogs popping to the surface in spring is not something I want to repeat. 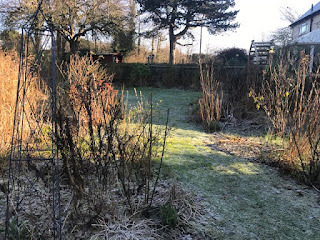 The shadow and frost line divides the garden. 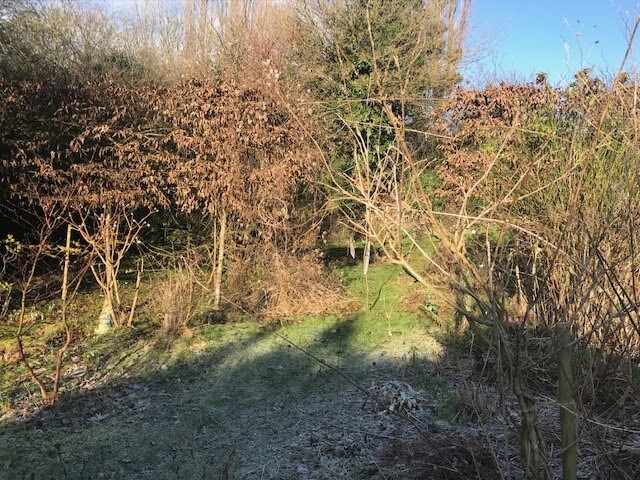 The Wild Garden is green and the snowdrops shine in the winter sun. I love days like these, the crisp brightness of the sun is rewarding. It is a perfect day for a garden visit to see someone else's snowdrops and/or hellebores. This will be done.